Take advantage of free Wi-Fi on Monument Circle, brought to you by HotSpot Wi-Fi Pods and WGU Indiana. Bring your office outdoors: take a seat with your laptop at a Spark parklet, have a walking meeting, or do your work on a blanket on the Monument lawn! Prizes available throughout the day, including a Colts ticket drawing! 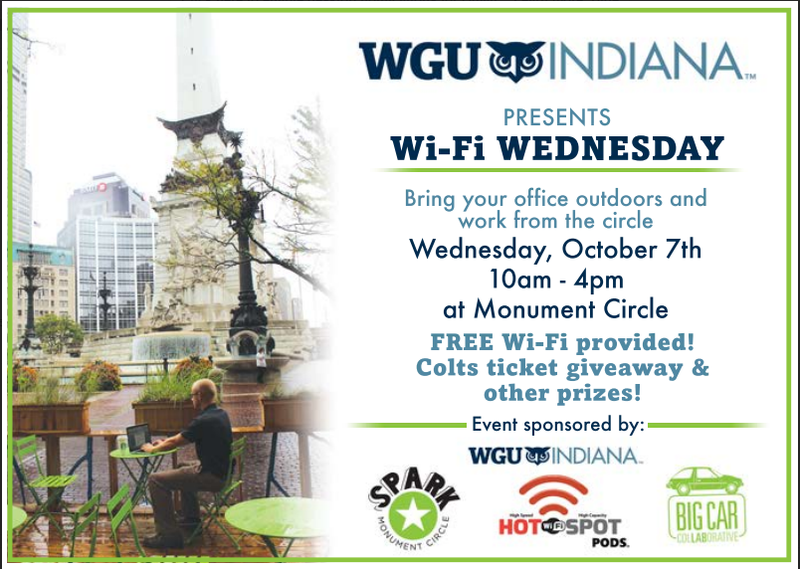 Wi-Fi Wednesday is presented by HotSpot Wi-Fi Pods, WGU Indiana, Big Car, and Spark Monument Circle.